The Promoting a Culture of Peace for Children Society is offering small grants to fund child centered fine arts projects (music, drama, visual arts and dance) that promote a culture of peace and non-violence for children and reach a wider audience. A maximum grant of $175.00 is available to groups working with children from pre-school to Grade 12. It is intended to cover materials and presentation costs but cannot be applied to staff wages. Please download and complete the application form and send via email to susanruzicpc2@gmail.com. 2. Signed agreement to follow project guidelines and procedures. Gandhi's Birthday - Gandhi's birthday was chosen as one of the deadline dates to make submissions for funding. Mohandas Karamchand Gandhi was born on October 2, 1869. His birthday is an opportunity to consider his accomplishments and legacy. Gandhi was the preeminent leader of the non-violent protest against English imperialism in India. He remains an inspiration to peaceful civil rights movements and activism across the globe. Gandhi died in 1948, but he still serves as an example of what a single person can be accomplish with heart as opposed to aggression. In celebration of his birth and life, choose to live as he lived and; "(B)e the change you want to see in the world." International Day for the Elimination of Racial Discrimination - Human Rights Day is celebrated every year on December 10th. The date was chosen to honour the United Nations General Assembly's adoption and proclamation on December 10, 1948, of the Universal Declaration of Human Rights (UDHR). This was the first global definition of human rights and one of the first major achievements of the new United Nations. It is on December 10th that the five-yearly United Nations Prize in the Field of Human Rights and Nobel Peace Prize are awarded. Many governmental and nongovernmental organizations active in the human rights field also schedule special events to commemorate the day, as do many civil and social-cause organizations. Human Rights Day - The United Nations’ (UN) International Day for the Elimination of Racial Discrimination is observed with a series of events and activities worldwide on March 21 each year. The day aims to remind people of racial discrimination’s negative consequences. It also encourages people to remember their obligation and determination to combat racial discrimination. The International Day for the Elimination of Racial Discrimination was established six years after an event, known as the Sharpeville tragedy or Sharpeville massacre, which captured worldwide attention. This event involved police opening fire and killing 69 people at a peaceful demonstration against the apartheid “pass laws” in Sharpeville, South Africa, March 21, 1960. The UN General Assembly called on the international community to increase its efforts to eliminate all forms of racial discrimination when it proclaimed the day as a UN Day of observance in 1966. It also called on all world states and organizations to participate in a program of action to combat racism and racial discrimination in 1983. It held the World Conference against Racism and Racial Discrimination, Xenophobia and Related Intolerance in 2001. The UN continues its work to fight against all forms of racial intolerance. Visited Vancouver and Lower Mainland Elementaryand Middle Year Schools January/February 2011. The Fountain of Peace was reassembled at each school and stones from around the world were hung in random order creating a world without borders. Each participating school was twinned with another country and a mural with messages and images created by the Canadian children was offered as a gift to the twinned school. A special song has been written for the Fountain's journey and was sung by children across Canada. The children’s voices were collected and then overlapped to create a recording of a collaborative collection of Canadian children singing a peace song in Canada. The City of Coquitlam celebrated their 2nd annual Canada Day celebration at Lafarge Lake, Pinetree Way, Coquitlam. This was an arts-based Canada Day event with visual, fine and performing arts taking place through-out the day. There was a Promoting Cultures of Peace for Children Society tent at this free fun-filled family event. This event took place Thursday July 1, 2010 with two activities, a peace train made with playdough and a "tree of leaves" similar to the Avatar "tree of souls" with messages of peace on a live tree. 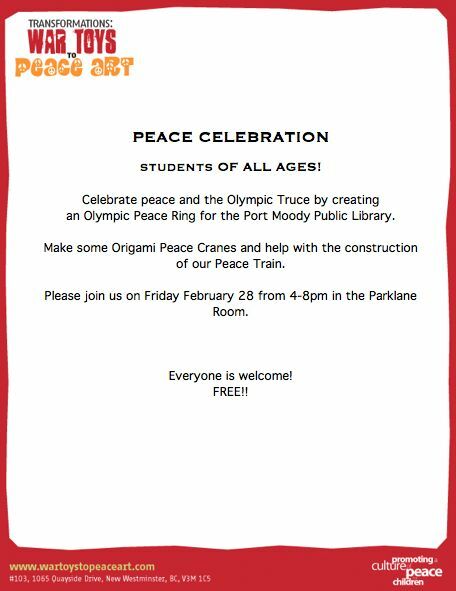 - Make Olympic Truce peace rings at the Old Barn Community Center between 4 - 6:30 pm. - 4 - 8 pm at the Port Moody Public Library. Children's Olympic Truce celebration took place in the Parklane Room. Those who attended made a peace ring and participated in other peace related activities. - Art displays in the cases in front of the children's department at the New Westminster Public Libray. - Opening remarks by Ellen Woodsworth, Vancouver City Councillor. * All proceeds donated to the benefit of the ongoing educational programs of Promoting Cultures of Peace for Children (non-profit) Society. Violent toys/video games were used to make peace art. Several peace art stations for youth were available. Saturday March 14, 2009 11:45 a.m.
"Acts: Transformation from War Toys to Peace Art" (11 mins) with Susan Ruzic speaking about the project after the video. Michael Furdyk's role as our Sharing the Dream partner in Youth Global Citizenship is powerful. As one of Teen People's "20 teens that will change the world", Michael has shared his opinions about Youth Engagement and experiences as a member of the Net Generation by speaking at dozens of events, including the World Congress on IT, the US Government's National Youth Summit, Microsoft's Anytime, Anywhere Learning Summits, The Business Council, and TED. He has made numerous media appearances including The Oprah Winfrey Show, Time Magazine, Fast Company, Business Week, CNN, MSNBC, and USA Today. He is a board member and advisor to numerous groups including Microsoft, Pollution Probe, the Anytime, Anywhere Learning Foundation, and several other national and global organizations. Now he has a role with our Youth here in B.C. Student and Teacher Preparation Materials : What Are the Criteria for Global Citizenship? · Pre WebCast activities available at 10:40 a.m. Pacific Standard Time - Click for the prewebcast document. Please contact us with details of Peace Art events that you would like posted on this site. 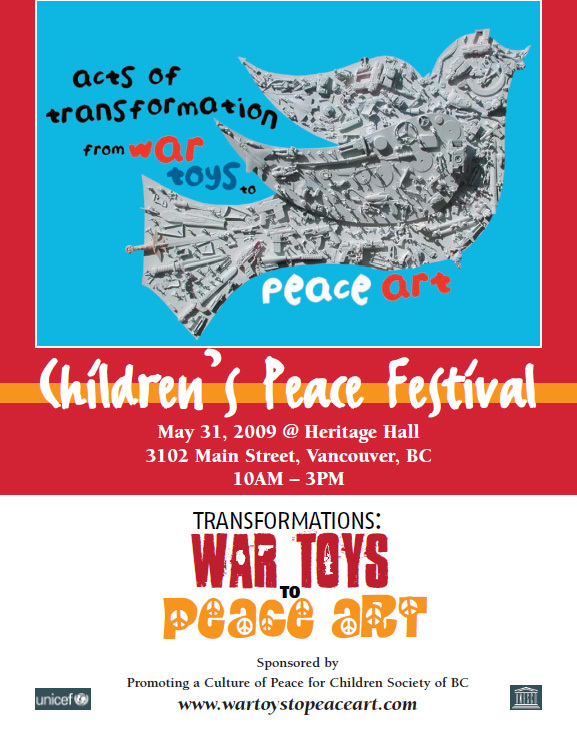 The purpose of the Promoting a Culture of Peace for Children Society of BC is to work on and organize education projects and activities that promote a culture of peace and non violence for Children. © War Toys to Peace Art, Promoting a Culture of Peace for Children Society 2008. All Rights Reserved. XHTML/CSS Validated.